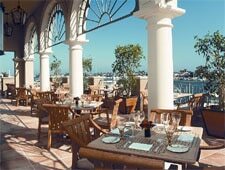 Classic and California cuisine with a Newport Harbor view. : The renovated Balboa Bay Resort’s First Cabin restaurant sits right on scenic Newport Harbor and has a comfortable, classy interior and a sunny patio. The breakfast menu offers lots of healthy options, and traditional American favorites like eggs Benedict and buttermilk pancakes. At lunch, you can order the creamy lobster bisque with its big bites of lobster, or opt for a sandwich, entrée salad, steak or seafood. Dinner is a more formal affair, so start with the house-cured gravlax carpaccio, escargots bourguignon or seared ahi with lemon grass-scented avocados and a delicate seaweed salad. For mains, try the seasonal specialties or signature dishes such as butter-seared sand dabs, Châteaubriand for two, juicy Colorado lamb rack or the Austrian-style paprika rahm schnitzel (veal scaloppine in a mushroom Cognac sauce accompanied by homemade spätzle). Dessert is worth the wait, especially the carrot cake and warm chocolate torte. The wine list is full of well-known bottles, mostly from California and France.